Item Type: USB Fan. - The Cooling fan can be positioned to stand upright or laid flat to cool various electronics and components. 1Piece USB Fan. - Connector: USB Connector. - Use for PC Computer, Xbox for PlayStation and other electronics and components need to cooling. Online Sales Only. It will not be shared in any other way, your details are 100% secure. Manufacturer reference: ELT-CDUFAN-80-EU. 1 Dual 80mm USB Fan. 2 In 1: 2 fan connect to one USB interface, plug into 1 USB port. 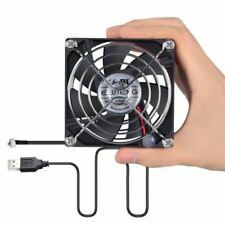 Capacity:USB Dual Fan-80mm. Rotation speed : 2700RPM/1 fan. USB cable length: 55cm. Airflow : 32CFM/1 fan. Durable: High quality bearings, work life up to 45000 hours. 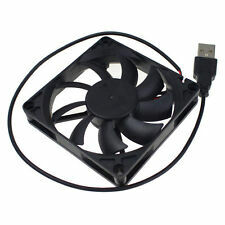 80 80mm USB fan 1. Not suggest connecting fan to USB hub. Rotating speed: 2000/2500/2900 RPM. Power: USB powered. Adjustable speed: Low / Middle / High three level. 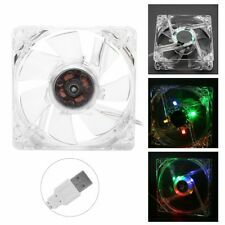 ELUTENG Dual USB Cooling Fans. 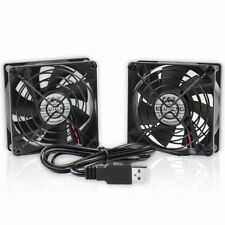 ELUTENG Dual 80mm USB Cooling Fan designed to cool various electronics and components. Two fans connecting to one USB power cable for your convenience to use. Super silent design minimum the noise to 35dB±10%. 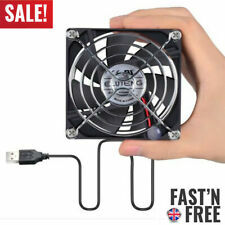 80mm USB computer fan. Support stand up right and laid flat gives you more possibilities of creation usage. Temperature drop 60%~80% in just few seconds. Low speed mood is suggested when you are trying to sleep.